1-step printing involves printing all information, both fixed and variable, on a blank white card in one single pass. For smaller organizations, 2-step printing will not make sense because typically you need to have a minimum volume of several thousand cards to even consider pre-printing graphics. But for larger organizations, both options are viable. What are the advantages and disadvantages of each? 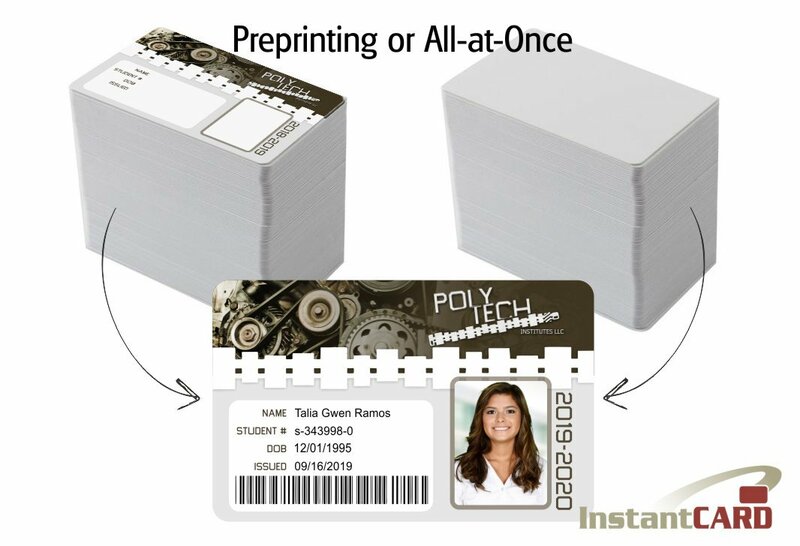 The 2-step process, with pre-printing graphics, will often allow for a very fast card issuance process. So if speed of card issuance (printing the variable information) is critical, then this is often the path chosen. This is because printing variable information like a name and an ID number in black ink can be done in seconds, on top of the pre-printed color graphics. Situations where time is of the essence include, for example, the issuance of 1,000’s of student ID cards during the first week of college, or the issuance of event passes at the start of a major conference or trade show. In addition to speed, the cost per card of a 2-step process can be substantially cheaper, because bulk pre-printing of the fixed color graphics is done using industrial offset print machines on large sheets of plastic. And the cost of printing black-only on individual cards is quite low. Of course, if color photos need to be printed on each card, this will immediately increase the cost and slow the process down substantially. The 1-step process will typically be more expensive on a per-card cost basis, but it will be substantially more flexible. This is because smaller printers are used, which can be deployed on-demand when and where they are required. And since pre-printed card stock does not have to be ordered and distributed in advance, the use of standard white card stock allows greater flexibility. So typically where flexibility, rather than speed and cost, is the primary driver, this process will be chosen. This is generally the case for corporate ID cards, where the flow of new hires rises and falls throughout the year. InstantCard can help you implement either one of these approaches, but our core service uses 1-step printing to provide our clients with maximum flexibility day-in and day-out.